Your client’s support team is the front line of your client’s business. They have the most direct contact with your customers, and are the most qualified employees to ask customers for a review. Yet many businesses fail to train their support staff to ask for reviews. Your client’s support team doesn’t necessarily care about how reviews help or hurt a business unless they’ve personally been praised or criticized in a review. By helping your clients educate their staff on why they should ask for reviews, how to ask for reviews, and when to ask for reviews, everyone wins. A recent study found 70 percent of the customers who were asked to write a review did so. Only 66% of customers have been asked to leave a review (down from 74 percent in 2017). Believe it or not this is good news. The vast majority of review management clients aren't using their secret weapon. Somebody (whether that’s the business owner, the support manager, or operations) needs to bring them into the fold and educate them, set expectations, and provide the tools to earn positive reviews that will boost morale and grow the business. If they receive the right kind of training. These results are a huge undertaking and they come with their own specific sets of problems. First, customer support reps don't have the training they need. They're not sure what to do, how to approach customers or even who to ask. Second, clients themselves aren't entirely sure what to do. Which means it's up to you. Your clients need your help. They need guidance and support. Can't they figure this out on their own? No actually, review platforms are changing the rules associated with their account. Yelp has decided to penalize businesses that decide to ask for reviews. Many review sites frown upon incentivizing reviews. It's difficult to carry alone. This guide should be used as a training aid. A helpful resource your clients can use to train their customer support teams. This guide should also be used to prepare your client's support teams for the problems that are coming. It should be used as a baseline or template for your specific industry. This guide isn't one size fits all. It isn't intended to be a perfect fit for every industry, niche or option. You'll need to figure out which details work best for your business. They keep you and your clients on the same page. But they also give your clients the knowledge they need to adapt to changing circumstances. Things don't always go according to plan. In fact, they rarely work out the way we'd expect. Here's how we fix that. (3.) their business has listings set up by the reviews are visible, but mostly negative. (4.) All of their reviews are focused on a single platform or channel (e.g. Google, Yelp, Avvo, etc.). (5.) They have many and frequent negative reviews, but they’ve been ignored and have no response from the business owner. Use data from Northwestern's Spiegel Research Center to validate the importance and effectiveness of reviews. Show clients how to measure the ROI of their review management campaigns and the effects on their conversion rate. You'll need to provide your client’s support leader with a firm foundation for their review management campaigns. Your clients will need a step-by-step review management checklist and playbook they can follow. Provide clients with the data they need (star ratings, recency/frequency of reviews, quantity of reviews per review site, competitor’s review portfolio statistics), then provide them with an opportunity to take ownership of the data. Ask them to participate in specific portions of the plan (e.g. calculating ROI, projecting conversion rates, choosing review platforms, etc.). This plan gives your clients structure, it means they're less likely to be stressed out if things go wrong. Your customer support teams needs structure and clarity. They'll need their employer or manager (your client) to provide them with a toolbox that's filled with the right resources. Customer support teams perform best when they're fueled by a strong incentive or motivator. You may need to help your clients come up with a list of ideas they can use as part of their incentive program. Create a list of incentive or bonus programs for your clients if they're not sure where to start. This doesn’t always have to be a monetary incentive. Sometimes employee of the month types of commendations or recognition can motivate your team. Remember that incentivizing your employees to ask for and earn reviews does not mean incentivizing customers to write reviews for the business. For most review sites, that would go against their ToS and can result in penalties. If your barista just spilled a hot latte on a customer, you’re probably not going to want to ask them for a review at that time, but if you went above and beyond to win a multi million dollar lawsuit, that would be a quality candidate to make the ask. Some industries have a ton of success asking for a review during the sales process, when the employee is both providing sales and customer service, like the automotive industry. Other times at the completion of the service or experience is the best time for the ask, like in hospitality. Asking face to face or on the phone offers the most personal touch, but also requires the customer to remember to go and complete the process completely on their own. An email or text will help guide the customer more effectively to review site, but feels a little less personal. A combination of the two would be the most effective: A phone ask, followed up with an email or test. Beyond the chosen communication method, the tone and appropriate of the ask should be taken into consideration. A law firm or doctor’s office might have a more professional, conservative tone when asking for the review when compared to a congenial home service provider or friendly real estate agent. Sometimes you have a customer who has been with you for a while and continues to use your service. You’ve already asked for a review, but don’t want to continue to lump them in with first time customers (though having them write a review on a second review site is always an option). You might ask them for internal feedback purely to help the business improve. Maybe a customer had a poor experience with your client’s business. In order to recover their experience, it would be worthwhile to set up a time to chat and really empathetically listen to their feedback on whether the business failed them and how it can be rectified. These instructions should be spelled out clearly and concisely for your support teams. You'll need to provide your clients with a series of templates (especially for high volume industries). But even if you only have a few customers who purchase high ticket items or services, having an email template that provides instructions on how and where to leave the review can be the differences between a disingenuous promise to leave a review and a happy customer delivering the goods. Here's why these templates are so important. They add to the pool of meaning without creating confusion. Support reps are able to communicate with customers when they have the basic guidelines in place. Let them know that they can customize the templates and add a personal touch. Those little personalization details will make a difference and remove a certain robotic quality that always seems to permeate templates. Which customers should be ignored? Which negative reviews should be left alone? Do your support teams know that? You'll want to make sure your support teams are focused on the clients who matter most. Customers (e.g. trolls, ragers and sadists) may try to use negative reviews to bully your client's support reps.
Customers are simple. Their needs are focused on solving their problem, meeting a need or producing a particular outcome. Here are the things customers need from support teams. This is an obvious starting point. If there's something fundamentally wrong with your product or service, the reviews you'll receive will mostly be negative. Your product or service should under promise and over deliver. Amazing reviews are great ways to boost trustworthiness. Counterintuitively, light to moderately negative reviews are also good ways to boost trustworthiness. Not that you can control it, but you're looking for an ideal ratio of positive/negative reviews. Five positive reviews for every negative review. The point is unless the customer is a frequent reviewer, they're not normally going to leave a review for a 'meh,' unmemorable experience. I mentioned the 7 customer motivations for reviews earlier. Your customers typically approach these details from that standpoint. These customer motivations give your clients the tools and resources needed to modify the templates I've mentioned earlier. The easier it is for your client's customers to write a positive review the more likely they are to do so. Unhappy customers are more motivated to write a negative review. They'll jump through all of the appropriate hoops needed to share their feedback. It's the opposite with positive reviews. Make it easy for customers to share a review. These details are obvious, aren't they? Your support team's review acquisition and management efficacy will only be successful if they receive the right kind of training. Most customer support reps don't have the training they need. They're not sure what to do, how to approach customers, or even who to ask. When your agency provides review management services, your clients themselves aren't entirely sure what to do. They need your help. They need direction and support. 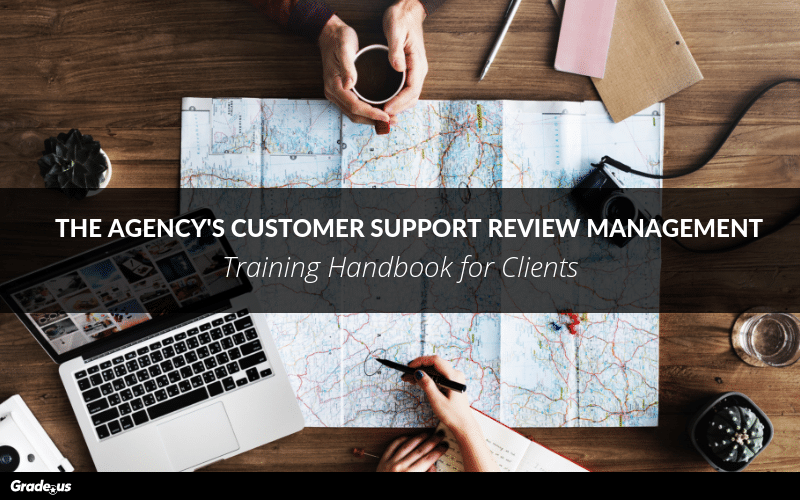 Use this helpful review management guide to train your clients and their staff. This guide really isn't intended to be a perfect fit for every industry, niche or option. You'll need to figure out which details work best for their business. No two businesses (let alone industries) are the same. The processes, branding, conventions, review sites, customer interactions, and review sites are comprehensively different for a hotel, a real estate agent, a wedding planner, a law firm, a doctor, an auto dealer or a home service provider, let alone a restaurant, retailer, or child’s birthday magician (Apologies, we haven’t written the magician’s guide to online reviews yet). If you give your support team the structure and tools that they need, you'll find your customers and your support teams produce the extraordinary results your clients need to grow.